Today, my friend Trish Watlington celebrates the third anniversary of the opening of her two Mission Hills restaurants, The Red Door and The Wellington Steak and Martini Lounge. In that scant amount of time, these two places--and Trish herself--have become fixtures in the San Diego food scene, even as the restaurants themselves have evolved. The most dramatic change has been that Trish brought in Karen Contreras and her landscaping company Urban Plantations to build and maintain a large garden at Trish and her husband Tom's Mt. Helix home. 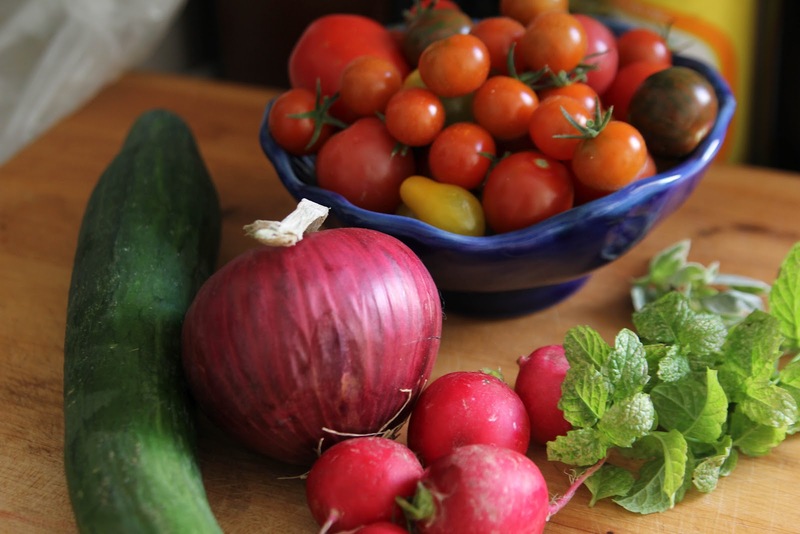 In the span of about a year I've watched the garden grow from conception to a full-on producing farm that supplies both restaurants with an abundance of gorgeous produce imaginatively used by chef Miguel Valdez. They even have bee hives on site housing bees that do double duty, as bees do, pollinating the plants and creating honey. So, it was no surprise to me when I invited Trish and some other friends to brunch a few weeks ago that she brought a salad filled with her garden's bounty. I loved this salad. Filled primarily with cucumbers, it's a huge augmentation of a favorite hot weather snack I make--thinly sliced Japanese or hot house cucumbers marinated in rice wine vinegar. I also toss in red pepper flakes and toasted sesame seeds. 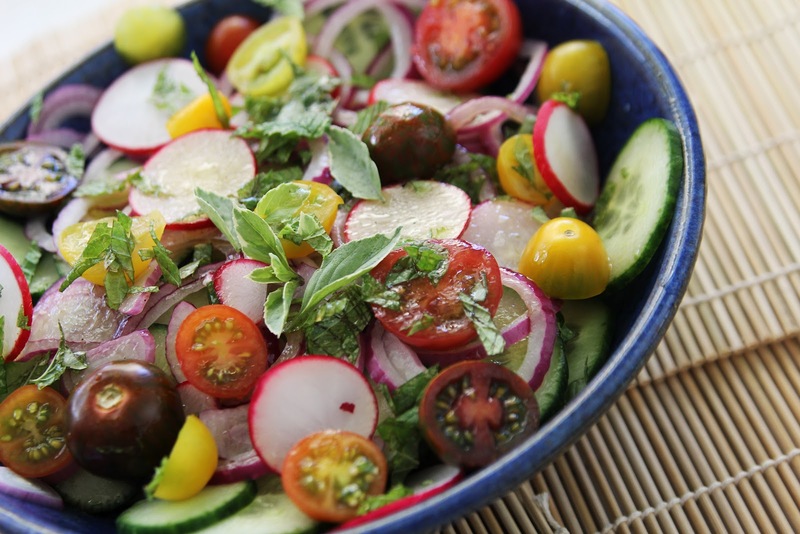 What Trish did, though, was combine the crisp summery cucumbers with crunchy radishes, sweet red onion, and juicy cherry tomatoes to round out the flavors and textures. Then she make it all pop with fresh mint and basil leaves, and flavored balsamic vinegar before smoothing it out with unctuous extra virgin olive oil. The best part is that it's one of those salads that tastes just as good on day two as when it's first prepared. In fact, it could easily be the topping to a bowl of room temperature quinoa or wheat berries for a full meal. Now, I've got Trish's recipe below, but like most salads it can be altered to suit what you have or have access to. I do have Sweet 100 tomatoes in full ripeness, but didn't have any purple basil or apple mint in my garden. So I substituted that with what's in containers on the patio: variegated basil and mojito mint, which served the purpose just fine, as did conventional radishes. Did I have fig and orange balsamic vinegar? Nope. But I did have some luscious blackberry balsamic from We Olive to use instead. I can also imagine adding slices of daikon, apple, celery, or other crisp produce to the mix. Oh, and one of the best tools I used to make this dish is my little hand-held Kyocera adjustable mandoline slicer. 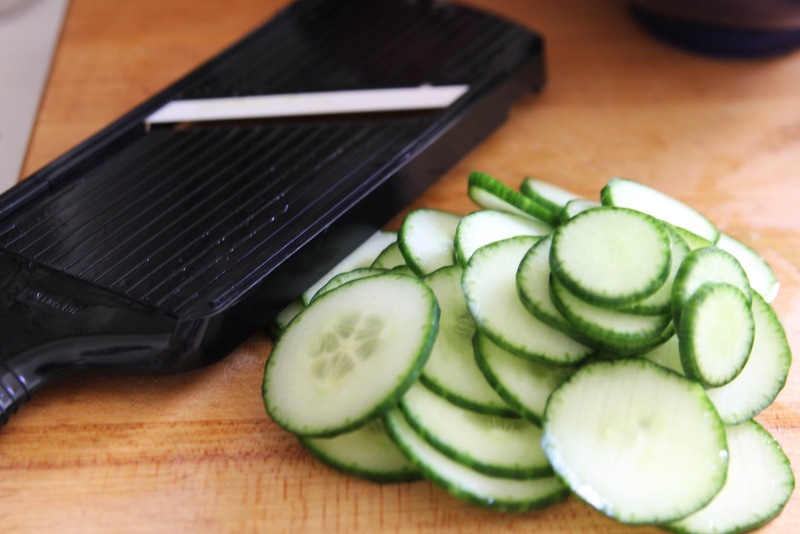 I can't remember where I bought it (perhaps on Amazon, which I've linked to) but it makes perfect thin--not ultra thin--slices and cost no more than $25. Happy anniversary, Trish! Here's to many more years for The Red Door and The Wellington! Combine the vegetables. Mix the dressing ingredients in a jar and shake. Pour onto the salad. Serve.